Brian Leiter (born 1963) is an American philosopher and legal scholar who is Karl N. Llewellyn Professor of Jurisprudence at the University of Chicago Law School and founder and Director of Chicago's Center for Law, Philosophy & Human Values. A review in Notre Dame Philosophical Reviews described Leiter as "one of the most influential legal philosophers of our time", while a review in The Journal of Nietzsche Studies described Leiter's book Nietzsche on Morality (2002) as "arguably the most important book on Nietzsche's philosophy in the past twenty years." 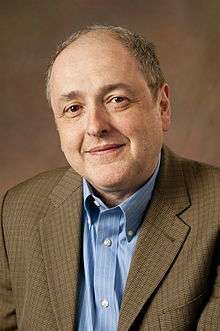 Leiter taught from 1995 to 2008 at the University of Texas School of Law, where he was founder and Director of the Law and Philosophy Program. He joined the University of Chicago faculty in 2008. His scholarly writings have been primarily in legal philosophy and Continental philosophy, especially Nietzsche and Marx. He has also been a visiting professor at universities in the United States and Europe, including Yale University and Oxford University. He is founding editor of a book series entitled Routledge Philosophers, and (with Leslie Green) of Oxford Studies in Philosophy of Law. He is also a prolific blogger. Leiter was also the founder and for 25 years the editor of the Philosophical Gourmet Report ("PGR"), an influential but also controversial ranking of philosophy PhD programs in the English-speaking world. After repeated protests, one in 2002 and one in 2014, Leiter resigned as editor and turned over the PGR to Berit Brogaard, a philosopher at the University of Miami. Born to a Jewish family, Leiter earned his Bachelor of Arts in philosophy from Princeton University (1984), and his J.D. (1987) and Ph.D. (in philosophy; 1995) from the University of Michigan, where his dissertation was supervised by Peter Railton. Leiter taught for two years at the University of San Diego School of Law, and was a visiting assistant professor of philosophy at the University of California, San Diego., before joining the faculty at the University of Texas School of Law in 1995, where he taught until 2008. At Texas, Leiter was founder and Director of the Law and Philosophy Program. In 2008, Leiter moved to the University of Chicago, where he is now Karl N. Llewellyn Professor of Jurisprudence at the University of Chicago Law School, and founder of Chicago's Center for Law, Philosophy & Human Values. Leiter has been a visiting professor of law or philosophy at Yale Law School, University College London, University of Chicago Law School, University of Paris X-Nanterre, University of California, San Diego, and Oxford University. He edited the journal Legal Theory from 2000 to 2008, and is editor of the Routledge Philosophers, a series of introductions to major philosophers, and (with Leslie Green) of Oxford Studies in the Philosophy of Law. Author Walter K. Olson described Leiter as "left-leaning" in his book Schools for Misrule: Legal Academia and an Overlawyered America (Encounter Books, 2011). and Leiter himself has professed sympathy for Marx, stating in an interview that, "On two central issues, Marx was far more right than any of his critics: first, that the long-term tendency of capitalist societies is towards immiseration of the majority (the post-WWII illusion of upward mobility for the "middle classes" will soon be revealed for the anomaly it was); and second, that capitalist societies produce moral and political ideologies that serve to justify the dominance of the capitalist class." Leiter's scholarly writings have been in two main areas--legal philosophy and Continental philosophy--although he has also written about metaethics, religious liberty, and other topics. Philosophical naturalism has been a major theme in both contexts. In legal philosophy, Leiter has offered a reinterpretation of American Legal Realism as embodying a prescient philosophical naturalism and a defense of what he called "naturalized jurisprudence" in his book Naturalizing Jurisprudence: Essays on American Legal Realism and Naturalism in Legal Philosophy (Oxford University Press, 2007). Upon publication, Jeremy Horder wrote that the "book will confirm Brian Leiter 's place in the front rank of legal theorists in the world today." Leiter also wrote the entry on "Naturalism in Legal Philosophy" for the Stanford Encyclopedia of Philosophy. On his view, "philosophers generally should aim to unpack the 'concepts that have been vindicated by their role in successful explanation and prediction of empirical phenomena'" and thus should “'take seriously the…social scientific literature on law…to see what concept of law figures in the most powerful explanatory and predictive models of legal phenomena such as judicial behavior.' This methodological view, however, raises questions about why the legal philosopher should study only judicial behavior and not something else. More generally, the naturalist owes an account of what features of law are most in need of explication and why." Leiter is also a scholar of Continental Philosophy, and is co-editor with Michael Rosen of The Oxford Handbook of Continental Philosophy. He has written a considerable amount on the philosophical work of Friedrich Nietzsche, including an article for the Stanford Encyclopedia of Philosophy. In particular, Leiter defended a reading of Nietzsche as a philosophical naturalist in his Nietzsche on Morality (London: Routledge, 2002) and in later papers, including one with Joshua Knobe on "The Case for Nietzschean Moral Psychology" in Nietzsche and Morality (Oxford University Press, 2007). In 2014, when student members of the University College London Union Council informed the "Nietzsche Club" that it could no longer declare an affiliation with the school, because the club was promoting "far-right" and "fascist" ideologies, Leiter first defended the club, saying Nietzsche was not a fascist, but later noted that if the club is a front for a fascist group, then it's a shame that Nietzsche was smeared as a fascist in the discussion. Leiter's most recent book, Why Tolerate Religion?, published by Princeton University Press , has proved controversial. The political philosopher John Gray wrote, "A model of clarity and rigour and at points strikingly original, this is a book that anyone who thinks seriously about religion, ethics and politics will benefit from reading." Christopher L. Eisgruber, the President of Princeton University, said. "Every reader will learn something from this remarkable book, and, beginning now, every serious scholar of religious toleration will have to contend with Leiter's bold claims." By contrast, the website of the conservative Family Research Council said the book was "one of the most troubling and intellectually discreditable books by a serious American scholar in some time." The book was named an "Outstanding Academic Title" by Choice in 2013. Leiter has also published work on meta-ethics, social epistemology, the law of evidence, and on philosophers Karl Marx, Martin Heidegger, and Ronald Dworkin. In 1989, while he was a graduate student Leiter made a list of what he believed to be the top 25 graduate philosophy programs in the United States. Called the Philosophical Gourmet Report, this list came to be known as "the Leiter Report" and has been circulated since the early 1990s by philosophy departments and individuals. It became internationally recognized. Published by Wiley-Blackwell, they are a controversial ranking of graduate programs in philosophy in the English-speaking world. The PGR was described by David L. Kirp in a 2003 New York Times op-ed as "the bible for prospective [philosophy] graduate students." George Yancy, in Reframing the Practice of Philosophy: Bodies of Color, Bodies of Knowledge (SUNY Press, 2012), opined that Philosophical Gourmet Report ranking: "is, of course, very controversial. However, as is often pointed out, there is no real alternative." Carlin Romano, in America the Philosophical (Knopf Doubleday Publishing Group, 2013), referred to the PGR rankings as "often-criticized" and "biased towards mainstream analytic departments". Leiter's rankings of graduate programs in philosophy have been especially controversial. In 2002, 175 philosophers signed an open letter calling on Leiter to stop producing the PGR. In fall 2014, over 600 philosophers signed a petition to boycott the PGR organized by some philosophers at University of British Columbia to protest what they called a "derogatory and intimidating" e-mail sent by Leiter to one of their colleagues, who Leiter claimed had threatened him. 24 of the 56 members of the Advisory Board of the PGR thought it best that he relinquish control over the Report's management. In response, Leiter appointed a co-editor for the 2014 report Berit Brogaard, a philosophy professor at the University of Miami and agreed to step down as editor after its publication. Leiter dismissed the criticisms as coming from people whose organizations had received a poor ranking, or from feminists upset with his stance in favor of due process for men accused of sexual harassment. He subsequently retained a lawyer to sue the organizers of the 2014 protest for defamation. "Professor Leiter ... said there had never been any impropriety in his administration of the report but 'if someone feels editing the PGR means forfeiting certain expressive rights, then I accept that they have a reason not to participate while I remain as one of the editors. And since I value my expressive rights (including my right to express myself in ways some others may find offensive), that gives me an additional reason to dissociate from the PGR so that those philosophers will, I hope, participate in the future.' At least, unlike Socrates, Professor Leiter isn't being forced to drink hemlock for saying it as he sees it." Leiter has also edited a ranking of U.S. law schools, which The Washington Post describes as "well-known," and was hired by Maclean's magazine in Canada to produce a ranking of Canadian law schools. Leiter is a prolific blogger, running three blogs, one on philosophy (and political commentary), one on law, and one on Nietzsche. Leiter's philosophy blog includes both professional news and polemics, for example, critiques of proponents of intelligent design, and the 2003 Invasion of Iraq. He has also written critiques of journalists and philosophers, including Romano, Thomas Nagel, Leon Wieseltier, and Paul Campos. Leiter is also a vigorous defender of academic freedom, having spoken in support of Steven Salaita both on-line and on television. He also wrote in The New York Times in defense of John Yoo against calls for Berkeley to investigate him. ↑ "Center for Law, Philosophy, and Human Values - University of Chicago Law School". uchicago.edu. Retrieved 1 November 2016. ↑ Kar, Robin Bradley (31 July 2009). "Review of Naturalizing Jurisprudence: Essays on American Legal Realism and Naturalism in Legal Philosophy". Retrieved 1 November 2016 – via Notre Dame Philosophical Reviews. ↑ "Ken Gemes and Simon May, eds., Nietzsche on Freedom and Autonomy — Hunter College". cuny.edu. Retrieved 1 November 2016. ↑ "Brian Leiter - University of Chicago Law School". uchicago.edu. Retrieved 1 November 2016. ↑ "Book Series - Routledge". routledge.com. Retrieved 1 November 2016. ↑ "Oxford Studies in Philosophy of LawVolume 1 - Oxford Scholarship". oxfordscholarship.com. doi:10.1093/acprof:oso/9780199606443.001.0001/acprof-9780199606443. Retrieved 1 November 2016. ↑ "An inconclusive PGR update". typepad.com. Retrieved 1 November 2016. 1 2 3 4 5 6 "Brian Leiter". The University of Chicago Law School. Archived from the original on October 16, 2013. Retrieved December 14, 2013. ↑ Walter K. Olson (2011). Schools for Misrule: Legal Academia and an Overlawyered America. Encounter Books. 1 2 "Leiter Reports -". 3ammagazine.com. 19 December 2011. Retrieved 1 November 2016. ↑ "Naturalizing Jurisprudence". oup.com. Retrieved 1 November 2016. ↑ Leiter, Brian (1 January 2014). Zalta, Edward N., ed. The Stanford Encyclopedia of Philosophy. Retrieved 1 November 2016 – via Stanford Encyclopedia of Philosophy. ↑ Marmor, Andrei; Sarch, Alexander (1 January 2015). Zalta, Edward N., ed. The Stanford Encyclopedia of Philosophy. Retrieved 1 November 2016 – via Stanford Encyclopedia of Philosophy. ↑ Leiter, Brian (1 January 2015). Zalta, Edward N., ed. The Stanford Encyclopedia of Philosophy. Retrieved 1 November 2016 – via Stanford Encyclopedia of Philosophy. ↑ Jenkins, Scott (3 January 2008). "Review of Nietzsche and Morality". Retrieved 1 November 2016 – via Notre Dame Philosophical Reviews. ↑ "The Recurring Myth About Nietzsche and Fascism". Huffington Post. June 6, 2014. ↑ Joe Patrice (June 9, 2014). "Bigmouth Law Professor Flubs Research, Defends Racists". Above the Law. ↑ Princeton University Press. "Leiter, B.: Why Tolerate Religion?". ↑ "Giant leaps for mankind". newstatesman.com. Retrieved 1 November 2016. ↑ "Additional Reviews and/or Endorsements for Leiter, B.: Why Tolerate Religion?". princeton.edu. Retrieved 1 November 2016. ↑ Schwarzwalder, Rob. "A Response to "Why Tolerate Religion?"". frcblog.com. Retrieved 1 November 2016. ↑ "Brian Leiter : Publications - University of Chicago Law School". uchicago.edu. Retrieved 1 November 2016. ↑ Schmidt, Peter (September 26, 2014). "The Man Who Ranks Philosophy Departments Now Rankles Them, Too". Chronicle.com. The Chronicle of Higher Education. Archived from the original on September 26, 2014. Retrieved September 30, 2014. .
↑ Edward Batchelder, John Palattella (February 1, 2001). The Real Guide to Grad School: The humanities. Lingua Franca Books. ↑ Carson, Theresa (April 15, 1999). "Philosophical Gourmet Report Ranks Chicago Tops in Continental Philosophy". The University of Chicago Chronicle. 18 (14). Retrieved June 18, 2011. 1 2 George Yancy (2012). Reframing the Practice of Philosophy: Bodies of Color, Bodies of Knowledge. SUNY Press. ↑ Ana Dubnjakovic, Patrick Tomlin (2010). A Practical Guide to Electronic Resources in the Humanities. Elsevier. ↑ Kirp, David (October 27, 2003). "How Much for That Professor?". The New York Times. Retrieved May 28, 2015. ↑ Carlin Romano (2013). America the Philosophical. Knopf Doubleday Publishing Group. ↑ Mangan, Katherine S. (18 January 2002). "175 Philosophy Professors Blast Ranking of Graduate Programs". Retrieved 1 November 2016 – via The Chronicle of Higher Education. 1 2 3 Schmidt, Peter (26 September 2014). "The Man Who Ranks Philosophy Departments Now Rankles Them, Too". Retrieved 1 November 2016 – via The Chronicle of Higher Education. ↑ Andy Thomason (October 10, 2014). "Controversial Philosopher Will Step Down as Editor of Influential Rankings". The Chronicle of Higher Education. ↑ "The boycott statement from September contained falsehoods (plus the actual lawyer letter to Jenkins and Ichikawa)". typepad.com. Retrieved 1 November 2016. ↑ "Hear no evil". The Australian. ↑ Jonathan H. Adler (September 26, 2014). "The professor who ranks and rankles". The Washington Post. ↑ Political Animal, Intelligent Design Kevin Drum. The Washington Monthly, March 24, 2004. ↑ "Leiter Reports: A Group Blog: On Norman Geras and the proposition that "there was no persuasive moral case against the Iraq war" (Leiter)". typepad.com. Retrieved 1 November 2016. ↑ "Leiter Reports: A Philosophy Blog: Carlin Romano: Total Ignorance of Philosophy is No Obstacle to Opining about Richard Rorty". Leiterreports.typepad.com. September 9, 2007. Retrieved August 2, 2013. ↑ "Leiter Reports: A Philosophy Blog: Thomas Nagel Jumps the Shark, Part II". Leiterreports.typepad.com. December 2, 2009. Retrieved August 2, 2013. ↑ "Leiter Reports: A Philosophy Blog: Why review a book of philosophy when you can sneer at it? (Leiter)". Leiterreports.typepad.com. February 19, 2006. Retrieved August 2, 2013. ↑ "Brian Leiter's Law School Reports: Whenever there is an opportunity to attack the First Amendment and academic freedom, Paul Campos is there!". Leiterlawschool.typepad.com. April 16, 2008. Retrieved August 2, 2013. ↑ "University of Illinois Repeals the First Amendment for Its Faculty". Huffington Post. August 23, 2014. ↑ "Freedom of Expression and Education". wttw.com. Retrieved 1 November 2016. ↑ "Torture and Academic Freedom". The New York Times. August 20, 2009.